The date for the admixture seems a bit too recent to assume tight linkage with the Indus Valley Civilization. I mean, the upper range for the ASI/ANI admixture in this model is 2,000 BC. By this time the “mature” period of the IVC was virtually over. It had essentially collapsed entirely by 1300 BC, which isn’t even in the mid-range of admixture dates. Instead, based upon the dates alone, you’d presume the mixture between the two groups happened because of the fall of the IVC, not the rise. Say some Near Eastern farmers migrated into the Indus Valley region from Persia near the dawn of agriculture. They found native populations living there, but they rather quickly displaced them with minimal admixture, leaving largely “pure” hunter gatherers to their east. Centuries later, some mixture of Aryan incursions and drought caused the cities to be abandoned. The Dravida migrate to their west and south in search of better agricultural lands. They do not find these lands as empty as their ancestors found the Indus, as the locals have picked up some limited Neolithic knowledge. But they have enough of an advantage to dominate the new “mixed-race” polities, and impose their language. They don’t stay ahead of the Aryan wave however, which ultimately sweeps over most of the Indo-Gangetic plain. The Aryans form what amounts to an empire of the word, if not a formal empire, linking together a huge region culturally and linguistically. 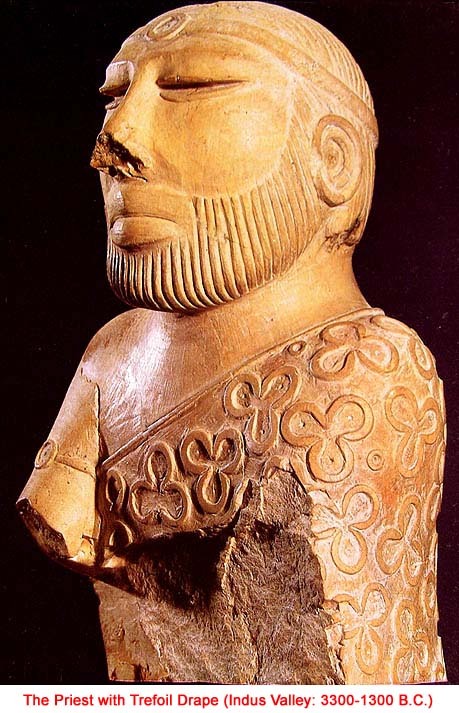 This causes backflow of ASI-admixed people into the Indus Valley. Still, the level of ASI-admixture stays lower because the area was never fully abandoned. But today, the line between those with higher versus lower ANI still does roughly follow the Pakistan/India border. The problem with such a scenario, however, is the admixture between the ASI/ANI components would have to be nearly concurrent – at most a few centuries apart. If the two happened basically concurrently wouldn’t we not be able to detect them at all? 1) my priors say the admixture dates are too recent. 2) that being said, these methods are biased toward picking up the last signals. they could have missed earlier signals. There was a paper mentioning this figure in Advances in Anthropology. The figure likely represents an East African (a slave?) immigrant into their civilisation. migration; in particular, mixture always postdates migration. Aren’t Andaman Islanders an ASI population that is not admixed with ANI? The précis here seems to say so in so many words: http://genetics.med.harvard.edu/reich/Reich_Lab/Welcome_files/2009_Nature_Reich_India.pdf . Are there studies that show ASI-relatedness of Veddas? no. they diverged from ANI 20-30,000 years ago. they are the unmixed population closest to ASI. additionally, in this paper they report that they might be differentially related to different ASI groups because of gene flow from ASI => andaman. Don’t forget (if they haven’t mentioned it yet) technologies such as the bow and especially the outrigger canoe verify the existence of outside contacts that may have left genes there. Great to see a complex topic being addressed with some data. This paper shows a mixture event in the sequence: Andhra – Tamil Nadu – Kashmir (?) – and lastly Uttar and Pakistan. If late admixture dates can mask early admixture, this needs to be explicitly stated in the results. Mongols, Australians, nothing should be a priori ruled out. Experimental design should probably be as open ended as possible, otherwise researchers are biasing results by a priori excluding what they think (“know”). ANI and ASI are theoretical constructs that the blogosphere now treats as some kind of given. Hypotheses and models (testable speculations) are great, but the next step is to run them through the gauntlet of aggressive data gathering and see how they hold up. If Baloch component is a hybrid ASI/ANI component, then that would mean that the Baloch component seen in Europeans points to migration out of India. I always wondered why this couldn’t have happened. The migration event would have occured before further admixture with ASI folks. Check out break down of India by regions on National Genographic Project which claims South Asians are mixture of Southwest Asians, Southeast Asians, Northeast Asians, Mediterranean & Northern European. Southwest Asians = Represents the first migration from Africa through Southwest Asia to the Indian subcontinent. Southeast Asian = Reflects mixing between populations from this region and those living in India, perhaps with the spread of rice agriculture or the Austroasiatic languages such as Munda, and is found at highest frequency in eastern India. Mediterranean = Arrived with the spread of agriculture into India from the Fertile Crescent within the past 10,000 years. Northern European = Represents more recent interaction with people of ultimately European origin, perhaps via the ancient Indo-Iranian-speaking steppe nomads of Central Asia, who are thought to have migrated into India around 3,500 years ago. Your suggestion of 3000BC for initial admixture does not comport with Reich’s paper. Also, it is not clear how agriculturalists settling in the Indus Valley could trigger a major admixture event between ANIs and ASI throughout India. Also, it begs the question, if there are signals of middle-eastern admixture around 3000BC why are they not visible? Also, there is evidence of farming in Mehrgarh as far back as 7000BC, so the purported movement from the middle-east must have happened around 7000BC or earlier and not around 3000BC as suggested. I have to agree with the authors of the paper that the first admixture probably occurred as a result of the collapse of the major IV complex and the second was triggered by the arrival of a small band of IA speakers whose genetic signature is barely visible today but culturally and linguistically the impact has been huge. ASI is misnamed as it relates to the southeast Asian Neolithic and the Austroasiatic languages. The most rational way to imagine ANI and ASI is two waves of food producers pouring into the subcontinent in its northern half from opposite sides. Kennedy describes ‘Cro-Magnons’ as present in Mesolithic India with the Balangoda race to their south. This places a distinction between Europeoid and Veddoid Indians even in the Mesolithic and though the Ganga Valley caucasians must’ve left some genetic legacy, they were swamped by West Asian and Southeast Asian food producers. Lastly FWIW crania from the BMAC outside of South Asia were described as possessing Veddoid traits.